Providing quality furniture and design service since 1994. Patricia White Interiors is uniquely housed in two adjoining historic homes, located in Kalamazoo's Central City. 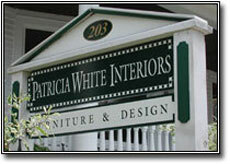 Patricia White Interiors offers furniture selections for the living, dining, family, and bedrooms, as well as home office. Design services include accessories, fabrics, upholstering, window treatments, floor and wall coverings.